Using one of our quality underfloor heating thermostats, you will be able to control the heating mats swiftly and efficiently with a quick warm-up time and optimised running costs. Your floor heating thermostat works in an almost identical way to your central heating clock timer - simply program it to run at the times you want it to be warm! As the heat is spread uniformly across the entire floor you can then use a moderate temperature rather than a high setting to provide consistent heat throughout the room. 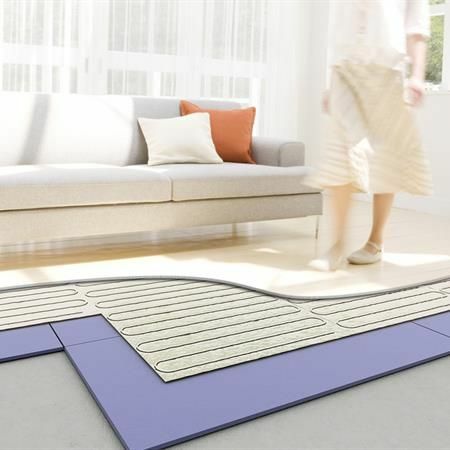 Using Ambient Electric’s underfloor heating mats in your home will provide adequate heat throughout without cold-spots or the need for regular maintenance associated with traditional radiators systems which rely on a boiler. Depending on the specification, our heating mats can provide sufficient heat to be the sole source for most rooms in your home. They can also be used under a range of floor types including tile, vinyl, laminate, wooden floors* and carpet. * Maximum wood thickness 18mm, or warm up time will be slowed and heat output greatly reduced. Overall Electric underfloor heating is more efficient than other forms of electric heating and most other convection systems as 100% of the electrical energy is turned into heat. To give an indivcation of running costs you could expect to pay as little as of 1p per square metre, per hour of heating. Therefore, a 10m² squared area bathroom could cost 10p per hour of heating using underfloor mats. Assuming the heating is on for 2 hours in the morning and 3 hours in the evening, it would cost approximately 50p per day, or roughly £15 per month. (based on 2017 average UK electricity prices). Why not contact us today to discuss which underfloor heating system is right for you, to lower your energy bills and increase the comfort of your home!